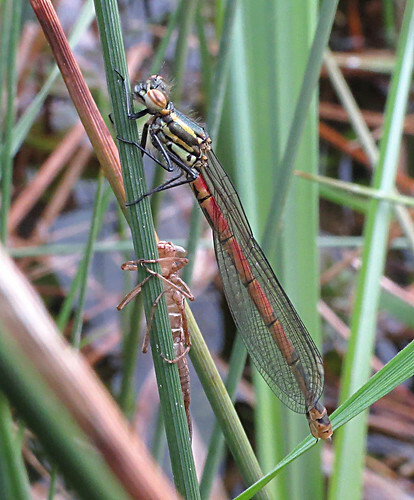 Despite the prolonged cold spring, the Odonata season began surprisingly early in VC61 during the latter part of April, with typically the first species emerging at Tophill Low NR in East Yorkshire being Large Red Damselfly Pyrrhosoma nymphula. Small numbers early on, before the species emerges en-masse. 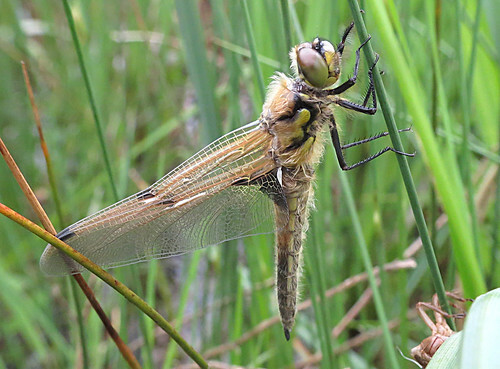 And then come the Four-spotted Chaser Libellula quadrimaculata – the commonest large species at the start of the summer on site – and wonderful to watch metamorphosize from larvae into free-flying winged predators. 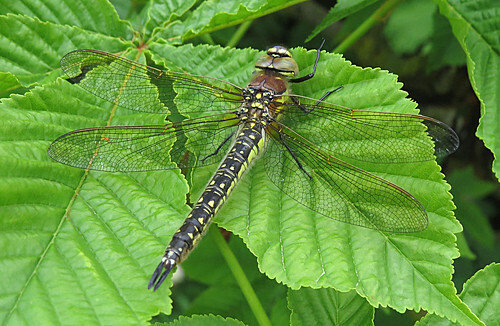 The formerly scarce Hairy Dragonfly Brachyton pratense is a commonly seen species nowadays at Tophill Low and across the VC61. 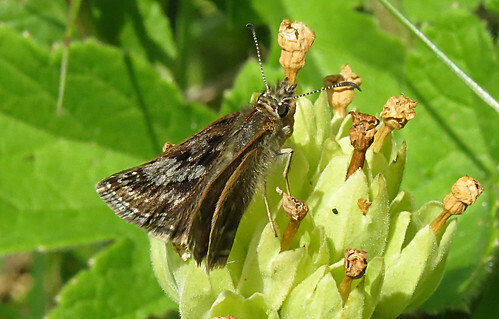 Once again, breeding was confirmed with several exuvaie collected this spring from the pools of the nature reserve and it looks likely to remain a regular fixture over the forthcoming years. 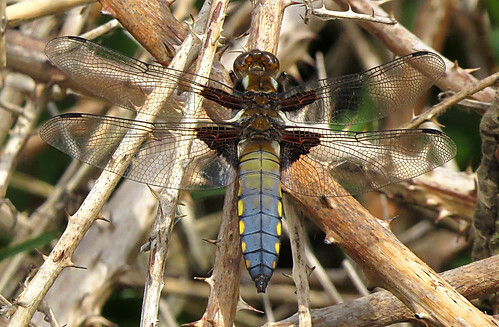 Broad-bodied Chaser L. depressa is also out in small numbers once again this May, but again, the exuvaie prove hard to find. No doubt the species breeds on site, but to date very few larval cases have been found over the years since it was first recorded. The cold spring has meant it has been a quiet period for Lepidoptera on site. However, with a change to warmer temperatures, scarce species have been appearing. 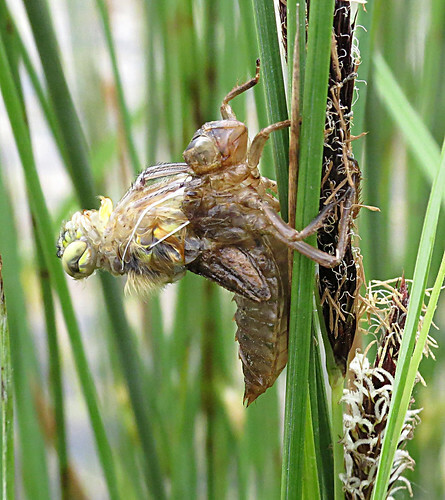 May 5th saw the second Dyseriocrania subpurpurella recorded on site – the only previous record occurring in 2011. 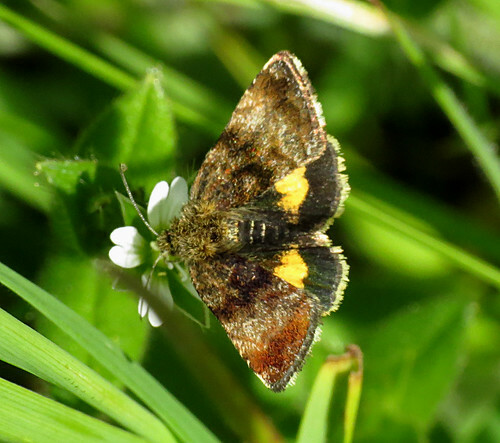 Small Yellow Underwing Panemeria tenebrata was recorded last year, the first reserve record since 1993, and carefully searching this month has yielded multiple records of this stunning little day-flying moth. 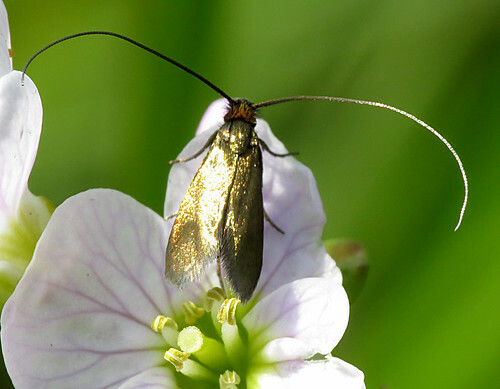 Careful scrutiny of the many Cuckoo Flower Cardamine pratensis has once again turned up a small number of Cauchas rufimitrella, including records of the species in new parts of the reserve. Incredibly, despite the large clumps of Cuckoo Flower in certain areas, this tiny moth proves hard to find at times. 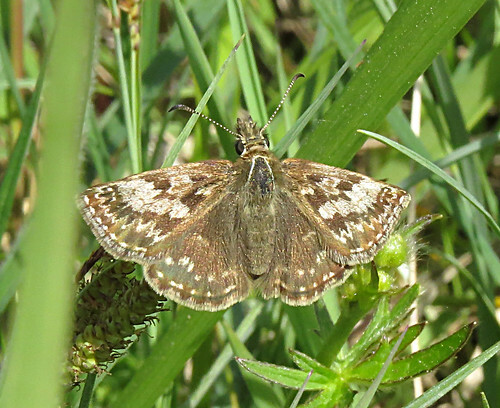 The search for the two species photographed above produced a surprise when a new butterfly for the reserve was found on May 18th in the form of this Dingy Skipper Erynnis tages. With further sightings following, it will be interesting to see whether the species actually colonises in forthcoming years or whether these will be an odd random record. As ever, for the latest from Tophill Low NR, check out the regularly updated twitter feed which can be found here.